Nestled right next to the sea with marvellous views of the Atlantic Ocean, the Blue Sea Costa Teguise Beach Lanzarote is just a few minutes’ walk from the city centre. Guests staying at this spectacular resort enjoy all-inclusive, self-catering, half-board and bed & breakfast boarding options. This aparthotel caters to all kinds of travellers. It features two-star facilities and services and a wide range of recreational activities. The guestrooms in the resort are tailored according to the needs of various travellers. They are a blend of conventional Canarian designs and contemporary furnishings, making the guests feel royal. With two outdoor swimming pools, children’s pool and a tennis court, there are several sports & entertainment options for all members of the family, making the hotel a perfect place for a relaxing and adventurous holiday. 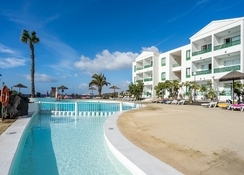 Blue Sea Costa Teguise Beach Aparthotel is a family-friendly hotel that is located about 800m from the beach in Costa Teguise (Lanzarote). The main strip is about a kilometre away, where you will find plenty of restaurants, clubs, bars and shops—you will also find some restaurants in the hotel’s immediate neighbourhood. The main beach is approximately 1.5km from the complex on the other hand the Costa Teguise Golf Course is at a distance of 4.4km. You can also organise trekking and hiking or visit Las Caletas (3.7km) and Arrecife (9km) the neighbouring seaside towns. The Lanzarote Airport is just 20 minutes’ drive away, making it convenient for the guests to board their flights on time. 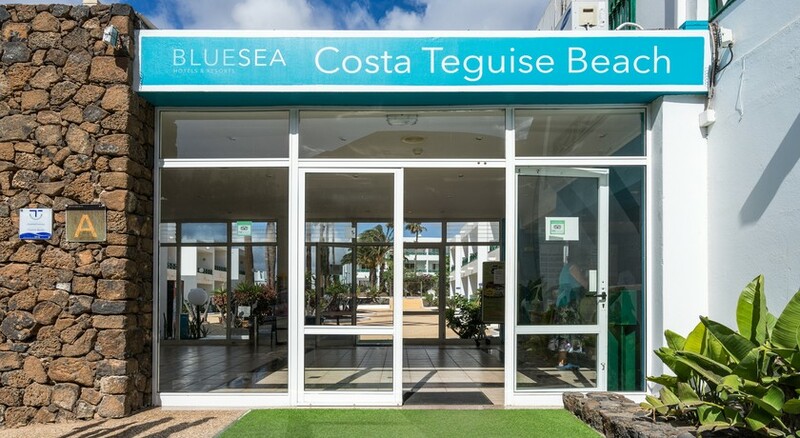 Guestrooms in Blue Sea Costa Teguise Beach are divided into following categories: one room apartment, study, apartment of a room (individual use), two-bedroom apartment, single parent apartment and superior apartment sea view. They include functional kitchenette, bedroom with twin beds, furnished balcony/terrace, en suite bathroom with amenities, and a few rooms come with a separate living room with sofas. The spacious and modern kitchen comes with electric hob, microwave, electric kettle, cutleries and other basic kitchenware—you can prepare your own meals. Facilities such as TV (additional cost), hairdryer (additional cost), safe deposit box (additional cost), dining table, fan and Wi-Fi (additional cost) are standard across all rooms. The balconies overlook the neighbourhood and the pool areas. The Blue Sea Costa Teguise Beach Lanzarote serves breakfast, lunch and dinner in the buffet restaurant. It also serves snacks throughout the day until 10pm. Or you can head to the pool bar offering snacks and incredible local drinks, cocktails and other premium and standard drinks all the day. Other than this, you also have other options like bed & breakfast and half board. 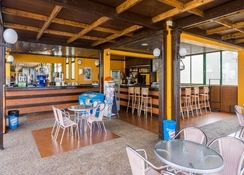 The bed & breakfast option is included in the price, while the half board option facilitates guests to have breakfast and dinner at the buffet restaurant in the resort. The resort features two outdoor pools, where you can swim and bask the sun. At the pools, you will be facilitated with pool towels (additional cost). Children too can have a lot of fun in the children’s pool under the supervision of the resort’s staff members. Guests can also make use of the excellent on-site tennis court. Golf-lovers will also find the hotel appealing, as the Costa Teguise Golf Course is about 5km from the property. We wanted all-inclusive, in a quiet and peaceful location by the sea. It was a quaint, and small resort which is exactly what we wanted. No loud music and reps! Thoroughly enjoyed are stay here, apartment was fine,bit dated but clean. Food was fine was always something you could eat. Location was brilliant with the beach in front of you and the town with pubs,restaurants and shops behind you. Staff were very pleasant and helpful . It wasn’t too bad. Pools were empty all the time which was great for us. Seawater pool was a little cold because of the wind but the other pool was where we spent most of the holiday. Food was standard. What you’d expect for cheap all inclusive. Drinks were ok. Shame it was two single beds not a double though.